Who, Where, When, What, Why, How? Legal Notice: I, Sahar Chinyere ('SC'), take full responsibility for the content that I post to this site. Neither my civil rights attorney, Nelson G. Alston, nor I would stand silent about violation of First Amendment Rights. I do not believe that the current government will tolerate violations of the U.S. Constitution either. Whether by accurate appearances or appearances that have been deliberately manipulated by the perpetrators, some people involved appear to be connected to the U.S. National Security Agency (NSA), the Central Intelligence Agency (CIA), and the U.S. Navy. 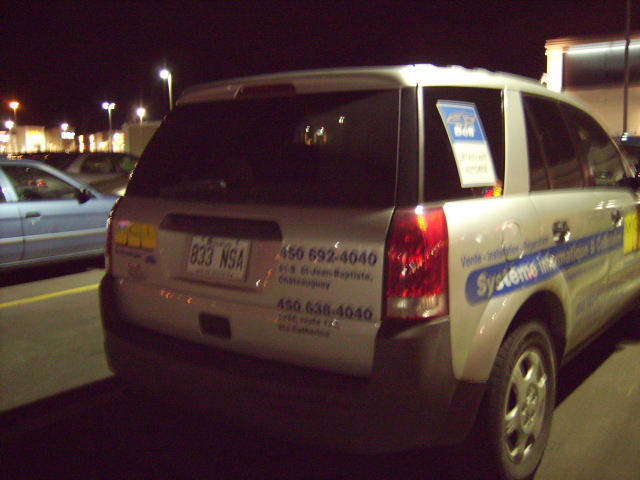 See a photo of a Bell Canada (according to its appearance) minivan with blacked-out windows and 'NSA' in part of the license-plate. supposed to... I do not discuss... Sorry." it does not perform field or human intelligence activities. that the agency does not always abide by these laws [sic]." telephone calls, and other intercepted forms of communication. [sic]"
It is not clear what all of the forms of communication are that are subject to interception and eavesdropping. Depending on the nature of such activity, it may help to explain the aforelinked photograph of a Bell phone minivan with blacked-out windows with 'NSA' in part of the license plate. This was photographed on November 6, 2007 in Brossard, Québec, Canada. Although the activity addressed further below in the What Section of this webpage appears to take place at least in the United States and Canada, at least in the states of Colorado, Maryland & New York and in the provinces of Ontario & Québec, there are reports from many people of similar activity in many locations worldwide. In particular, people have reported similar activity from additional parts of the United States of America and Canada as well as from the Commonwealth of Australia, the People's Republic of China, the Federal Republic of Germany, Malaysia, Russia, and the United Kingdom. Over 600 accounts compiled by MindControlForums.com of people complaining of having been targeted with brainwashing technology. Note that physical torture and psychological torture can be tools of brainwashing. 11/23d/2013 Note: Sadly, the well presented set of survivors' accounts are no longer appearing there, although many more in total (including several by high-profile people) are now appearing online but scattered throughout the worldwide web. If someone knows who received permission to publish the survivors' accounts, SC is willing to help re-post the set pro bono. CNN article, "High-pitch alarm targets young people"
- No reporter's name is credited as of 11/23d/2013. The CNN WORLD article is reported from the location of London, England, and was updated on 2/12th/2008. Popular Science article, "Cop Tech 2010"
- Reinhard Kargl, reported from Los Angeles, USA, 2/1st/2007. 60 Minutes (CBS News) report, "The Pentagon's Ray Gun"
- David Martin, reported from Moody Air Force Base (southern Georgia), USA, originally broadcast on 3/2d/2008, updated on 5/30th/2008. 11/23d/2013 Note: There is not currently an option to view the written report, that accompanies the video, as a single webpage. Therefore please click on the arrow at the end of each webpage that leads to the next. The article's current # of webpages is 4.
used properly, there's no harm to your body." What constitutes proper use? Who decides? And who decides whether there has been resulting harm? is about as real as the placards they're carrying." One of the people interviewed by 60 Minutes, Sue Payton, an "assistant secretary of the Air Force and the Pentagon official in charge of buying the [Active Denial System]", said "You don’t ever, ever, ever want a system like this to be thought of as a torture weapon." The problem is that what people, across sectors, have been reporting through significantly growing groups (in both the number of groups and the number of members) such as Freedom From Covert Harassment & Surveillance (FreedomFCHS.com) is that they are being covertly targeted by such Directed Energy or 'Future' Weapons. Indeed, there has also been a growing number of deaths where 'Non-Lethal' weapons are suspect. Sensory impact & health effects may be immediate & acute to cumulative & chronic. An October 2007 letter by Congressman (retired, Missouri House of Representatives, USA) Jim Guest regarding "non-lethal weapons" misuse. "This letter is to ask for your help for the many constituents in our country who are being affected unjustly by electronic weapons torture and covert harassment groups. Serious privacy rights violations and physical injuries have been caused by the activities of these groups..."
Rep. Guest's letter also refers to RFID (Radio Frequency Identification) technology being used to track Americans. 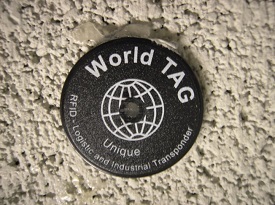 See a photo, "World TAG Unique RFID - Logistic and Industrial Transponder" that was photographed in the stairwells of SC's residential building in mid-2007 in Ontario, Canada. See SC's video (titled, "SoundFreq's&LightWaves--http://www.facebook.com/SnoEOawc") of what appears to be related sound frequencies that appear to impair concentration accompanied by unusual, rhythmic light waves. 11/23d/2013 Note: For some reason, the 10 guidelines of the Nuremberg Code are no longer appearing at http://ohsr.od.nih.gov/guidelines/nuremberg.html -- Therefore the link now being provided above to the Nuremberg Code guidelines leads to University at Buffalo: The State University of New York (that credits http://ohsr.od.nih.gov/guidelines/nuremberg.html as its source of the guidelines). CIA-funded LSD trial at McGill University in Montreal, QC, Canada. Although their use of the phrasing, 'haphazardly diagnosed', is questionable, the article at the link is very informative. 11/24th/2013 Note: Although there is presently what may represent an "aches-mc.org" (Advocacy Committee for Human Experimentation Survivors – Mind Control) icon within the top banner, the link that originally appeared directly above (http://www.aches-mc.org/documentation.html), to an article in which the use of the term 'volunteers' was questionable, now leads to what looks like it might be a third-party page -- It features "Related Links", most of which are labeled with some type of "Health Insurance", from 'Low Cost Health Insurance' to 'International Health Insurance'. The symptoms of people who appear to be Extra-Targeted Individuals (a term created by SC since realizing that targeting of people is taking place on a mass-scale around the world), individuals appearing to be targeted extra by or particularly sensitive to misuse of abnormal sound frequencies & accompanying light waves, have interesting overlap with increasingly diagnosed cases of conditions such as Hashimoto's Encephalopathy. interactive-communicative, social and emotional rehabilitation..."
11/23d/2013 Note: The March 2006 publication has moved from http://www.musictherapyworld.net/modules/mmmagazine/issues/20060331100549/MTT7_1_2006.pdf to the link directly above. The above suggests that many human functions can be affected by sound. If sound can be used to help the brain, how tempting would it be for some people to research the role of sound in harming the brain? administration of LSD to "unwitting subjects in social situations." At least one death, that of Dr. Olson, resulted from these activities. that CIA mind control research continued." This may help to explain why "Extra Targeted Individuals" complain of "Organized Stalking" including by people who appear to have varying skill levels (e.g. with regard to surveillance). However, there is also a psychological tactic called "noisy surveillance" in which targets are deliberately made to notice that they are being surveilled. since they would be used on non-U. S. citizens." Hear an audio file of a network of men some of whom were by where SC was residing in mid-2007 in Ontario, Canada in which reference to the CIA was made. "It should be hopefully very soon like in about an hour's time tops. I will, I will. I'm working on it right about now..."
Note that Colorado, USA is referenced from where the audio took place in Ontario, Canada. U.S. Senate Appropriations Committee for which Dr. S. of University Physicians, Inc. appeared. http://abcnews.go.com/WNT/story?id=2166664&page=1&singlePage=true with regard to modern non-consensual human experimentation by participating University Physicians - Participants included some from Colorado, including from the group headed by Dr. S. People who were in no condition to volunteer to be experimented on with artificial blood were treated as "volunteers" unless they somehow knew to wear a specific bracelet opting out of the experimentation. It was indicated that the population at large was unaware of even such bracelet's existence. http://www.cnn.com/2010/HEALTH/10/01/guatemala.syphilis.tuskegee/index.html with regard to one of the most egregious, non-consensual human experiments in medical history that ended in 1972 after four full decades only in response to the public's finally becoming aware. 11/23d/2013 Note: The link originally shared directly above (http://www.tuskegee.edu/global/story.asp?s=1207586) and a high % of other links that currently appear in the search results for "Tuskegee Syphilis Experiment" within the Impact on Health Care section at Tuskegee.edu currently lead to the message, "File Not Found". 11/23d/2013 Note: Previous to the link directly above was a link (http://cache.zoominfo.com/CachedPage/?archive_id=0&page_id=-1685736532&page_url=%2f%2fwww.pinnaclecare.com%2ffinding%2fphysician%3fid%3d62&page_last_updated=10%2f2%2f2008+10%3a34%3a10+PM&firstName=John&lastName=Sbarbaro) that presently displays the message, "We're sorry we couldn't find that page." c) free to use emerging technology such as the ability to use sound to affect many human functions in ways that instead benefit the public, e.g. neurological healing through beneficial sound as indicated by the Music Therapy Today Book Review. Copyright Notice: Chinyere.com Public Safety Alert content may not be re-distributed without written permission from Sahar Chinyere. will also be shared here going forward.